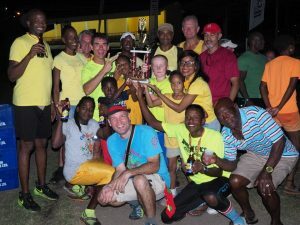 Hash Olympics Sports day was held at Tanteen playing field in St George and WOW – what a fun time was had by all. The day started out with a 1500 meter race and then a full team band march. From then on it was game on with races like the 4 legged race, the beer mile, the backwards race, the wheelbarrow race, the shoelaces tied race, the lime and spoon race, pass the cocoa race, the over 50 year old race, tug of war and many more. There are some really funny video clips of this day on our facebook page and lots of pictures. After lots of laughter, fun and games and a little cheating, Yellow Team (Short Arse) were awarded the giant trophy as overall champions of the Hash Olympics. Thank-you to all our sponsors that donated towards prizes and helped with this fun event.